The history of sovereign debt evolved over time along with the purposes for which governments borrowed: first state building, then public-good provision, and most recently social welfare and entitlements. Although many periods when debt-to-GDP ratios rose explosively culminated in funding crises, debasements and restructurings, less widely appreciated are episodes of successful debt consolidation achieved through rapid growth or budgetary discipline. This column analyses the economic and political circumstances that made these debt consolidation episodes possible. 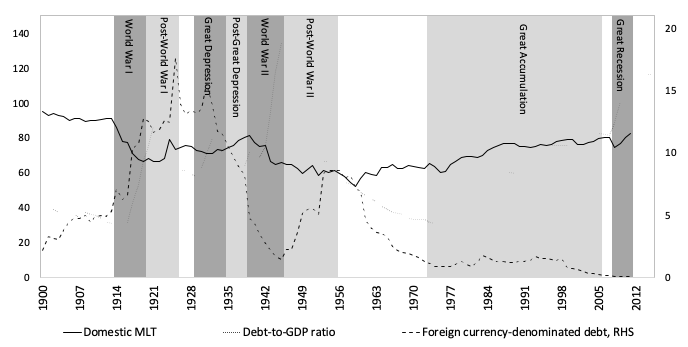 Sovereign-debt relief and its aftermath: The 1930s, the 1990s, the future? In a world still reeling from the Global Crisis, the policy debate has been dominated by the downside risks from excessive debt accumulation – be these growth slowdowns (Panizza and Presbitero 2013), financial instability (Brunnermeier et al. 2016), or debt default (IMF 2013, Eichengreen et al. 2018), although now there may be renewed appreciation of the uses and scope for accumulating debt (Blanchard 2019). In a recent paper (Eichengreen et al. 2019), we use history to illuminate both side sides of the story. Historical evidence helps because defaults on sovereign debt are not as frequent as on, say, corporate bonds. History can enrich our understanding of those features of sovereign debt that are associated with crisis resolution, since there are variations over time in the structure of debt contracts, their enforceability, and costs of default. But history also illustrates how governments have used sovereign debt to shape economic and political development. It shows how they have used it to build states, provide public goods, and complete infrastructure projects. Much early borrowing by sovereigns was motivated by the need to secure borders and fight military campaigns. Foreign military campaigns or the need to repel incursions by foreign troops could overwhelm existing revenue streams. The decline of feudal obligations for military service led sovereigns to create armies for hire, such as the condottieri of Venice, Florence, and Genoa. These soldiers had to be paid. Sovereign debt thus developed as a means of state survival (Stasavage 2011). It enabled the state to finance expenditures of uncertain size and duration. The 19th century was a transitional period when governments, while still borrowing to prosecute wars, issued debt to provide public goods. Domestic public debt took the turn first, with the issuance of bonds to finance education and public works. As incomes rose, manufacturing developed and cities grew, demands arose for clean water, sewers, and still more extensive public education. By the mid-19th century, sovereign debt was being used to finance everything from water and sewer works to railroads, ports, and canals. 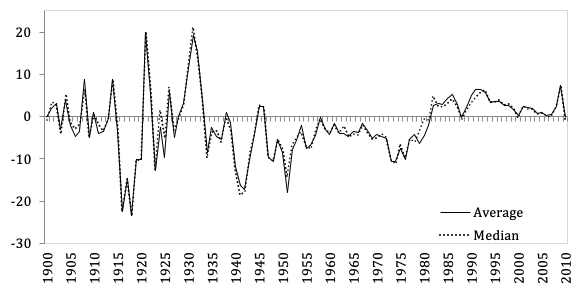 The 20th century then saw sharp increases in debt burdens as a result of major wars, but also as a result of recessions, banking panics, and financial crises, as well as public policy responses to these events. The late 20th century also saw, for the first time, a secular increase in public debt-to-GDP ratios in response to popular demands on governments for pensions, health care, and other unfunded social services. Countries have resorted to a variety of expedients to lower their debt burdens – from the insidious (debasement and inflation) to the extreme (default and restructuring). The prevalence of defaults has had a clear cyclical component. 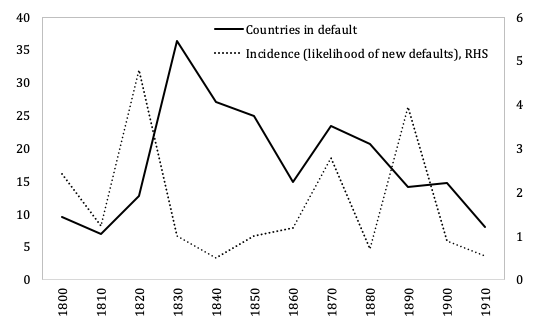 Figure 1 shows how before WWI, the incidence of defaults was concentrated around major financial crises (1826, 1873, 1890), a pattern repeated in the following centuries. Sources: Reinhart and Rogoff (2009) and authors’ calculations. Notes: countries in default refers to the number of independent nations in default in a given year over the total number of independent nations. Incidence refers to the unconditional probability of new defaults p. a. But the 18th and 19th centuries also saw governments going to extraordinary lengths to service and repay heavy debts incurred as a result of expensive wars. In order to lower their debts relative to GDP, countries can do three things: generate primary surpluses, reduce the real interest rate, or grow their economy and debt servicing capacity. Prior to WWI, debt consolidation was mainly achieved by running budget surpluses. Great Britain achieved primary surpluses for the better part of a century, and the US for the five decades after the Civil War. After WWII, in contrast, the growth rate–interest rate differential played a major role in reducing debt ratios. The favourable differential reflected both strong growth as a result of reconstruction efforts and successful catch up, and negative real interest rates supported by restrictive domestic financial regulations, capital controls and persistent inflation, as emphasised by Reinhart (2012) and shown in Figure 2. Notes: G-20 advanced countries included are Australia, Canada, France, Germany, Italy, the U.K. and the U.S. Source: Abbas et al. (2014a). In part, this commitment to responsible debt management and debt reduction in the 19th century reflected the fact that the franchise was not yet universal and that contemporary perceptions of the role of government were different from today. It also reflected recognition by decision makers that the maintenance of debt-service payments, even when difficult, could deliver lower borrowing costs in normal times and aid with the mobilisation of resources in the military and economic crises. Not least, it reflected good luck. Great Britain was not confronted with an equally costly war between 1815 and 1914, nor was the US between 1865 and 1917, and no economic slump as deep and long as the Great Depression of the 1930s occurred (Grossman and Han 1993). As a result, governments following this path found were able to issue debt at favourable interest rates, long maturities, and in their own currencies (Bordo et al. 2003). Not all governments were able to implement this good equilibrium, however. Some countries repeatedly defaulted and restructured their debts. Among advanced economies, inflation and financial repression were used to reduce domestic claims on the public sector, rendering debt consolidation through a combination of rapid economic growth and budgetary discipline the exception. Notes: G20 advanced economies included are Australia, Canada, France, Germany, Italy, Japan, the U.K. and the U.S. PPP-GDP weighted averages. Source: Abbas et al. (2014b). The change in debt-consolidation strategies also reflected on the structure of debt ownership. Figure 3 shows how the shares of advanced economy sovereign debt held by central and commercial banks rose in periods of stress, when governments leaned on their banking sectors. From the mid-1980s, however, banks reduced their sovereign exposure, reflecting portfolio diversification facilitated by capital account liberalisation and regulatory changes under the Basel Accords. This decline coincided with a rise in non-resident holdings during the Great Accumulation period, driven partly by the growth of nonbank investment funds. But while rising foreign participation can reduce borrowing costs and spread risks more broadly, it can also increase external funding risks, since foreign holdings are ‘less sticky’. In a sense, these developments mark a return to the prewar world of securitised sovereign debt with ownership dispersed internationally. This means, among other things, that financial repression is unlikely to be as effective as after WWII. Repression in that earlier era relied on tight financial regulation, capital controls, and limited investment opportunities. Today, a much larger share of advanced economy debt is held by non-residents, making it more difficult to maintain a captive investor base that accepts debt offering sub-market returns. In addition, regulatory measures compelling banks to hold domestic government debt and then inflate it away could threaten financial stability in the financially competitive, low-growth environment of the 21st century. The value attached to price stability by central banks and retail investors in government bonds in turn limits the political viability of surprise inflation. Higher inflation would also have indirect costs, in the form of a persistent departure from less risky long-duration debt. Governments would be trading off lower short-run debt-servicing costs for higher costs and heightened volatility in the future. Thus, not only would financial repression be difficult to implement under present circumstances, but its negative side-effects would persist. Abbas, S M A, N Belhocine, A El-Ganainy, and A Weber (2014a), “Current Crisis in Historical Perspective”, in C Cottarelli, P Gerson, and A Senhadji (eds), Post-Crisis Fiscal Policy, MIT Press, pp. 161-191. Abbas, S M A, L Blattner, M De Broeck, A El-Ganainy and M Hu (2014b), “Sovereign Debt Composition in Advanced Economies: A Historical Perspective”, IMF Working Paper, No. 14/162. Blanchard, O (2019), “Public Debt and Low Real Interest Rates”, Presidential Address to the American Economic Association, January. Bordo, M, C Meissner and A Redish (2003), “How Original Sin was Overcome: The Evolution of External Debt Denominated in Domestic Currencies in the United States and the British Dominions, 1800-2000”, NBER Working Paper No. 9841. Brunnermeier, M, L Garicano, P Lane, M Pagano, R Reis, T Santos, D Tesmar, S Van Nieuwerburgh and D Vayanos (2016), “The Sovereign-Bank Diabolic Loop and ESBies”, American Economic Review 106(5): 508-512. Eichengreen, B, E Avgouleas, M Poiares Maduro, U Panizza, R Portes, B Weder di Mauro, C Wyplosz and J Zettelmeyer (2018), “Independent report on the Greek official debt”, CEPR Policy Insight No. 92. Grossman, H and T Han (1993), “A Theory of War Finance”, Defence Economics 4: 33-44. IMF (2013), “Staff Guidance Note for Public Debt Sustainability Analysis in Market-Access Countries”, Washington, DC. Panizza, U and A Presbitero. 2013. “Public debt and economic growth in advanced economies: A survey”, Swiss Journal of Economics and Statistics 149(II): 175-204. Reinhart, C (2012), “The Return of Financial Repression”, CEPR Discussion Paper No. 8947. Reinhart, C and K Rogoff (2009), This Time is Different. Eight Centuries of Financial Folly, Princeton University Press. Stasavage, D (2011), States of Credit: Size, Power, and the Development of European Polities, Princeton University Press.